New Delhi : National General Secretary of Bhartiya Janta Party (BJP), Madhav says that, India, Pakistan and Bangladesh will make unity backs again one day and will build the united India. 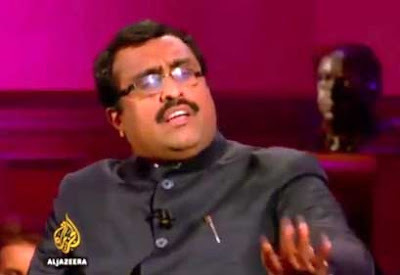 BJP National General Secretary, former spokesperson and national executive member of RSS, Ram Madhav was speaking in an interview with Al-Jazeera. He said that, India, Pakistan and Bangladesh will reunite to form 'Akhand Bharat' (undivided India). He also said, creating of the united India is possible with mutual consent and without any corrosion. Referring to the Rashtriya Swayamsevak Sangh (RSS), Madhav said that, "The Rashtriya Swayamsevak Sangh (RSS) still believes that one day these parts, which have for historical reasons separated only 60 years ago, will again, through popular goodwill, come together and Akhand Bharat will be created,"
"As an RSS member, I also hold on to that view." Said Madhav. However, he clarified, "That does not mean we wage war on any country, (or that) we annex any country. Without war, through popular consent, it can happen." "We call it Hindu - do you have any objection? India has one culture. We are one culture, one people, one nation," he told Head to Head host Mehdi Hassan at Al-Jazeera. "The only outstanding issue with regard to the Kashmir problem is the Kashmir under Pakistan occupation. The Kashmir that is an integral part of India, it has been proved time and again that it's an integral part of India." Said Ram Madhav.